There is little in the early years of Martin’s life that would lead one to conclude the lad was destined to spearhead the Reformation. He was born to Hans and Margaret Luder on November 10, 1483, in Eisleben, Saxony, Germany. His parents were not poor but of sufficient means to have their daily bread. During his first year of life, the family moved to Mansfield where Hans managed smelting furnaces used to extract metal from its ore. Martin went to school in Mansfield, Magdeburg, and Eisenach in preparation for university studies to become a lawyer. He completed his bachelor’s degree at the University of Erfurt and then earned his masters in 1505. As was common in the era, those who knew Latin often Latinized their names, so Martin Luder adopted Luther for his surname. Interest in the practice of law ended when he vowed to become an Augustinian monk after a close encounter with a bolt of lightning during a storm. Practical Hans was not happy with his son’s change of vocation. However, Luther did not yield to his father’s will and was ordained a priest in 1507. By 1509, Luther was lecturing on the Bible in Erfurt, but his continued studies, teaching, and as he put it, “monkery,” were directed by a troubled conscience regarding his sin. As he moved on to Wittenberg where he received his doctorate in theology in 1512, sin and works continued to occupy his thoughts. 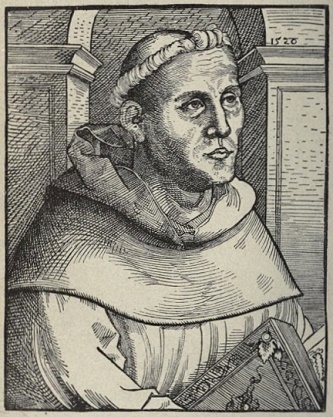 One of his Augustinian colleagues and the superior of the monastery in Wittenberg, Johannes von Staupitz, encouraged him through his struggle. Luther studied the Bible searching for a resolution to his spiritual dilemma. A key phrase in the Bible for his understanding of justification is first used in the Bible in Habakkuk 2:4, but is then also located in Romans, Galatians, and Hebrews, “the just shall live by faith” (1:17, 3:11, 10:38). Historians disagree over when the importance of justification by faith achieved its eureka moment for Luther, but the nineteenth-century church historian J. H. Merle D’Aubigné traces it to Luther’s trip to Rome in 1510 and his dissatisfaction with works of merit as defined by the papacy. Luther continued to teach Bible in Wittenberg and had increasing administrative responsibilities. In 1517, Luther had his first book published, but the more important writing to come from his quill that year were his theses in October. Following his trial at the Diet of Worms, his hiding in the Wartburg Castle, excommunication, and a warrant for his arrest, Luther continued to study and teach the Bible, advocate Christian schools, preach the Word, promote catechesis, write hymns, and generally produce more writings than would seem possible for anyone. His works, mostly completed, are in the process of being published in English in over seventy volumes. It is said “the pen is mightier than the sword” and the influence of Luther on the Reformation and Protestant churches has been extensive. As the years of his reforming work progressed, Luther was not only a teacher, writer, pastor, and reformer, but also a devoted husband and father. On June 13, 1525, Martin married Katherine von Bora. Luther had written against celibacy earlier in his career and he put it into practice when he married. Katie and several other nuns had been smuggled out of their nunnery on a wagon of empty barrels which had been used to store herring. His first meeting with Katie may have required pinching his nostrils or a good dose of perfume. The Luthers had children that included Hans, Martin, Paul, and Magdalena. Martin Luther died at the age of sixty-two in the place of his birth in Eisleben, February 1546. Luther had always struggled with eating too much, but at one point he commented that he would eat what he liked and die when God willed. In 2001, physician John Wilkinson concluded that Luther, who suffered from kidney stones, died from a heart attack caused by high blood pressure. As the Reformation developed it did so along two main theological lines of thought. Those following Martin Luther and his associates, such as Philip Melanchthon, became known as Lutherans. The first Lutheran state church was established in Sweden with its first archbishop appointed in 1531. Lutherans dominated the Scandinavian countries including Iceland, and of course, they were predominant in Luther’s homeland. The other line of Protestant theology came forth in the Reformed churches. The most well-known reformer of this line is John Calvin. The Reformed churches had their greatest influence in Switzerland, The Netherlands, some in Germany, the Huguenots of France, in Scotland primarily through the work of the Presbyterian minister, John Knox, and in England despite early influences of Luther’s thought. Other countries in Europe were influenced to some degree by the Reformation including nations currently dominated by Roman Catholicism such as Italy and Spain. It is the second line, Reformed theology, which is most important for Fellowship Presbyterian Church. The article in July will be a biography of the key proponent of Reformed doctrine, John Calvin.